This page was originally published on 21st February. "Jeremy Wright MP had asked to be kept informed. 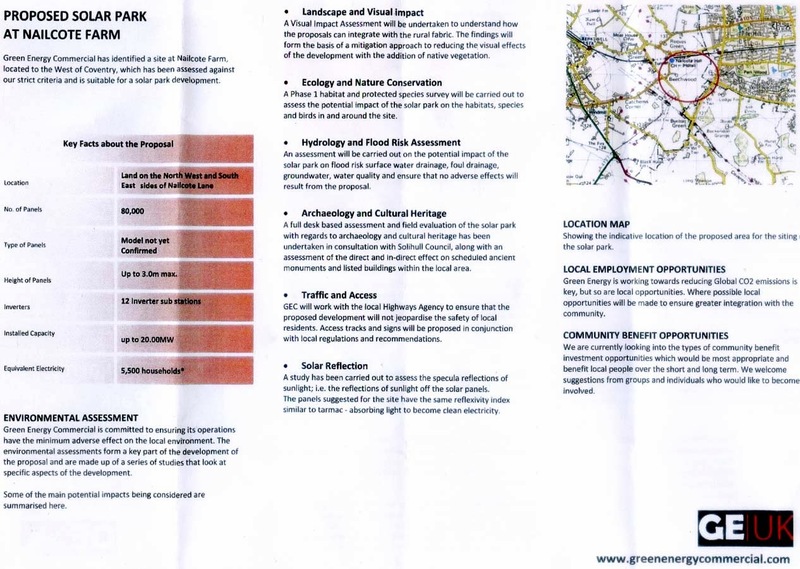 He had opposed a similar proposal at Deppers Bridge because of the inappropriateness of the site and it was hoped he would do the same for Burton Green. Rona was intending to see him. It was generally agreed that BGRA opposed the proposal. Cllr Hickinbottom said the Parish Council was likely to be opposed once planning permission had been sought. He advised a need to be vigilant with regard to planning applications in succession. Cllr Illingworth had recommended writing to the planners in Solihull to remind them that Burton Green was much more directly affected than anywhere within the borough and would wish to have a representative at the hearing. It was agreed that a small action group should be formed." Green Energy UK will be conducting a consultation at the Village Hall 4pm-7pm, Monday March 17th, followed by a presentation to the Parish Council at 7.30pm. It is understood that the area of the site will remain as agricultural land and the land beneath the panels will be used for limited sheep grazing. 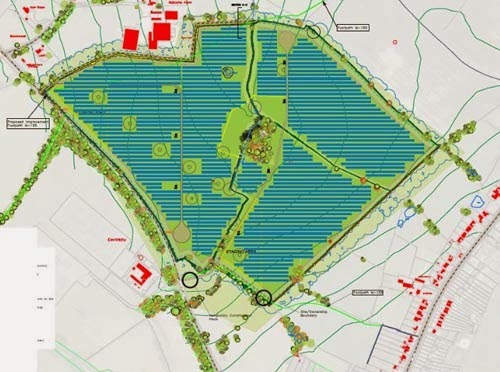 Burton Green Parish Council became aware this morning, 19 February 2014, of a proposed Solar Park at Nailcote Farm put forward by Green Energy UK Ltd. 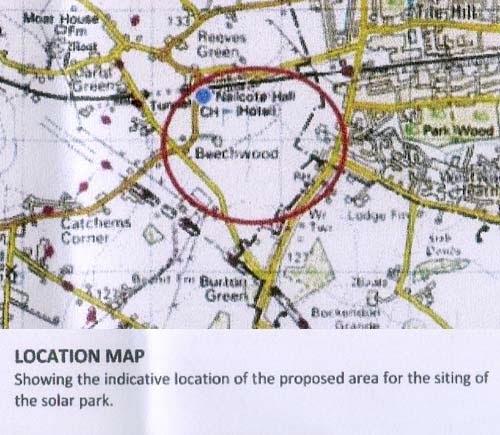 While the proposed solar park is in the Parish of Berkswell, our neighbouring Parish, we are an interested Party and so this organisation had a right to inform us of this consultation. It did not do so. This proposed development is a substantial one and may well affect those properties in Cromwell Lane which back on to Nailcote Farm fields. This news release is to make you aware of this development and the fact that Green Energy UK Ltd is holding an exhibition as part of its consultation on Friday February 21st. The Reading Rooms Berkswell from 3.30pm to 7pm. We have been in contact with Green Energy UK Ltd this morning informing them that they will need to make a presentation at Burton Green. 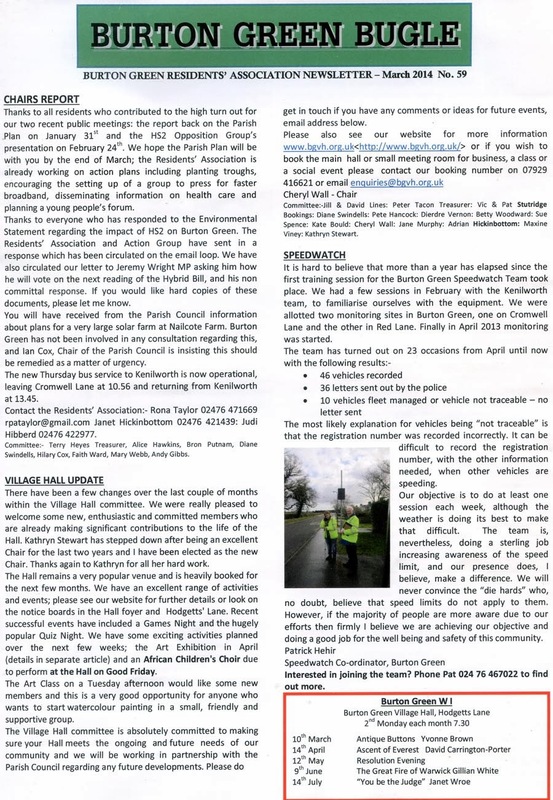 Further updates on this will be on the Parish council website, in the Parish notice board and in the next edition of The Bugle if available before publication. The Parish Council will be making representation on this matter once more is known and to this end we have now been invited by Green Energy UK Ltd to attend a Council briefing session on 21 February 2014 from 2.30pm-3.30pm. A number of Burton Green Parish Councillors attended the exhibition. Green Energy Commercial, the company concerned, have agreed to put an additional exhibition on at Burton Green Village Hall at a date to be arranged. Noise. The principal noise would seem to be the continuous low frequency hum from electrical DC/AC transformers. Devaluation of properties in Cromwell Lane. Effect on Nailcote Hall Hotel. The proposed area of the solar panel farm covers approximately 80 acres, as indicated on the map below. 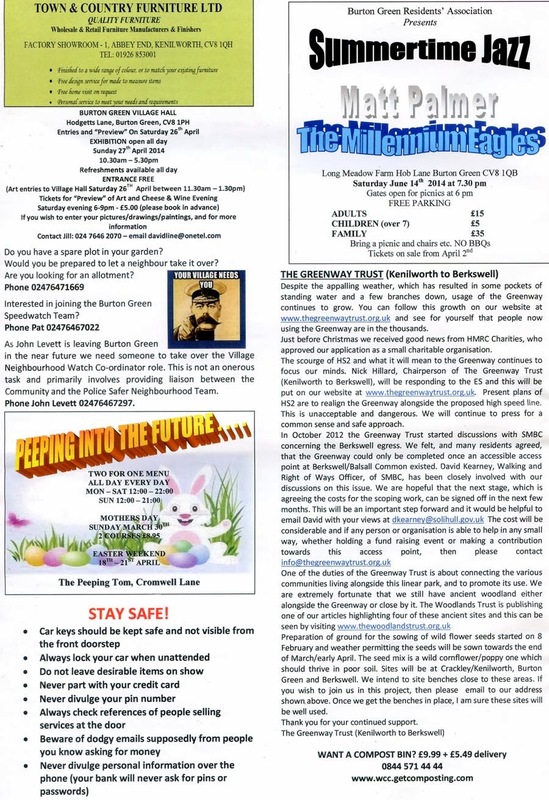 Below is a copy of a leaflet that was distributed to residents on 20th February. Hilary Cox; Alice Hawkins; Terry Heyes; Janet Hickinbottom; Bron Putnam, Rona Taylor; Diane Swindells. Apologies had been received from Andy Gibbs; Judi Hibberd; Faith Ward; Mary Webb; and Cllr Michael Coker. Village Hall: Diane confirmed that the plaque was to be moved as requested. Compensation consultation response: Judi had circulated this. Christmas tree: Joy and Rob Barnes had been thanked and would be provided with free tickets for the jazz event. Judi had booked the Village Hall for the night of carols around the tree on December 16th 2014. Nick Hogue’s letter: Rona had written to Jeremy Wright MP, as agreed. Letter from Burton Green School: As agreed, Rona had written to the school thanking the head for the information and wishing the school well with the new venture. A co-ordinator for broadband issues had not yet been found. Jerry Marshall had started running business club. HS2: The environmental consultation response had been completed and sent in. (Copy attached). The broken utility cover had been repaired. Archie had discussed the overgrown conifer with the resident concerned. Diane had sorted out the hearing loop issue. The Village Hall committee was looking at the cost of installing extra bands and microphones. Rona had written to Western Power about the decorative finials with no response. Diane wished to commend Western Power for all the work carried out on the electricity supply in Hob Lane. The minutes of the last meeting of January 7th 2014 were accepted. This matter was to be covered in other agenda items. Terry went through the report. He commented that the finances were in a reasonable state and gave details about expenditure regarding the ring fenced funds. 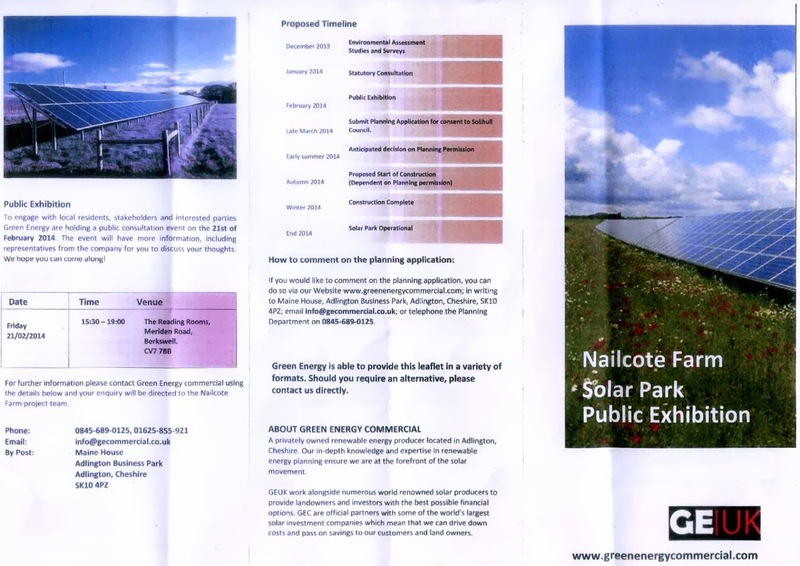 GE had agreed to pay £245 for the distribution of their literature about the solar farm proposal. There would be more costs for the jazz event such as ticket printing but ticket sales would, hopefully, re-establish the funds. £926.29 had been taken in subscriptions and this was thanks to the persistence of the collectors. The most recent Retired of Burton Green lunch had again been a success. Thanks were particularly extended to Diane for the excellent meal. £117 profit had been raised. It was noted that the hearing loop and microphone should be used by speakers in the future. The young people's evening was scheduled for September 12th. It would take the form of a young people’s forum followed by a social event. This would be planned at a later stage. Website. It was hoped that the jazz event in June would raise funds to consider the development of a BGRA website. Speedwatch. There was no specific report but Terry said the weather had been a problem as it affected the laser gun. One member asked if Speedwatch could take place in Red Lane and Terry said this was scheduled. He also said it would be good to get the police along to some sessions as their presence had a positive effect. Thanks were given to the team. 28th September afternoon tea with World War 1 theme. This had been proposed by Mary, Diane and Rona with the aim of capturing the spirit of the period with afternoon tea and perhaps a musical item. There was some discussion about what would appeal to different generations. The music hall item was not popular but afternoon tea, an exhibition of artefacts and possibly some games of the era were suggested. Details would be discussed at the next meeting. Thanks were due to the Parish Council which had acted swiftly to inform residents as soon as news of the proposed solar farm was received. Some Parish Councillors and residents had attended the exhibition at Berkswell and subsequently, thanks to Cllr Ian Cox and Rona, another had been held in Burton Green followed by a presentation to the Parish Council. Jeremy Wright MP had asked to be kept informed. He had opposed a similar proposal at Deppers Bridge because of the inappropriateness of the site and it was hoped he would do the same for Burton Green. Rona was intending to see him. It was generally agreed that BGRA opposed the proposal. Cllr Hickinbottom said the Parish Council was likely to be opposed once planning permission had been sought. He advised a need to be vigilant with regard to planning applications in succession. Cllr Illingworth had recommended writing to the planners in Solihull to remind them that Burton Green was much more directly affected than anywhere within the borough and would wish to have a representative at the hearing. It was agreed that a small action group should be formed. Rona, Mary and Terry asked to be on the group and others residents were welcome to get involved. Sincere thanks were given to Alice for arranging the excellent “Heart Start” evening. In turn she thanked attendees for their generous donations of f £120. Interest was expressed in making this an annual refresher course. The title of the event had been changed to “Summertime Jazz”. Terry had covered the financial aspects in his report. Parking was sorted as Burrow Hill Nurseries had offered parking places and Hilary was in touch with CJs regarding marshals. Publicity was being arranged in Look Local and Your Call. A marquee would cover the band in case of rain. The event would go ahead whatever the weather. A meeting was imminent and it was hoped the Plan would be made available by the start of April. It would be distributed by the usual delivery team. Apologies had been sent to Cheryl, the new Village Hall chairman as Judi had not been aware that she had been elected. She would be invited in future. Diane reported that the committee had been concerned with their responses to the environmental statement and the local plan. They were considering the design of a new village hall. Cheryl was to introduce herself to HS2. 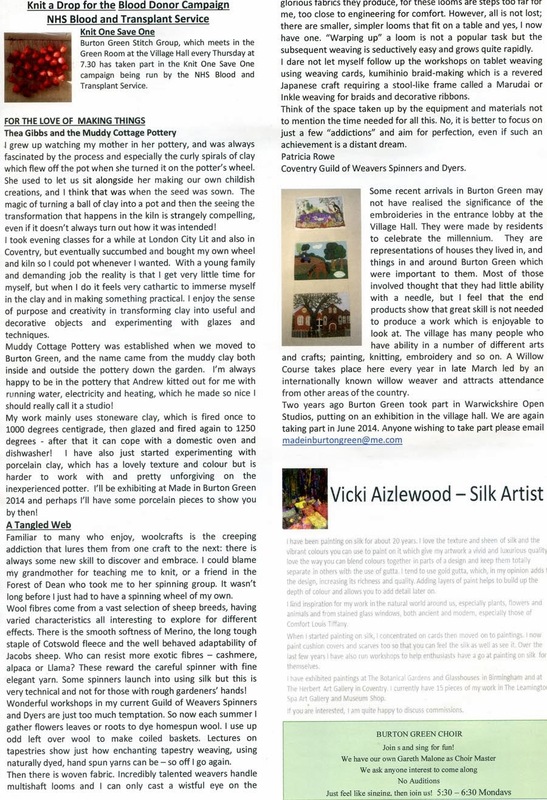 An art exhibition would be held on April 27th with a cheese and wine preview evening on the Saturday. The Village Hall BBQ was scheduled for July 12th. An African school choir was coming on Good Friday afternoon as part of a world tour and it was hoped as many people as possible would support them. Archie Taylor was representing Andy Gibbs as a spokesperson for the HS2 Action Group. He circulated copies of a paper that had been presented to 160 members of the Labour party. Having attended the Labour conference he felt there was significant opposition within the party and that needed to be harnessed. Archie explained the process of petitioning and felt it was very important that many organisations and individuals should petition. Archie had elicited support for petitioning from a variety of groups and individuals. His concern was centred on a deep bored tunnel for Burton Green. He warned that HS2Ltd would do its best to avoid petitioning or would aim to reduce the number of petitions presented to save time. Archie recommended appointing an “agent B” a well-informed individual who could petition on behalf of a group or several groups and it was suggested John Whitehouse might be approached for this purpose. John had already offered to facilitate a meeting of interested parties within the village in the week beginning April 7th. Andy and Archie would be involved. It should be decided what issues to petition on including the deep bored tunnel and mitigation of construction impact. All parties in the village needed to be invited to petition including the school and the Village Hall. Cllr Hickinbottom had reported back to the Parish Council meeting the previous evening about the results of the questionnaire on housing and facilities distributed at the open event. He outlined the findings to the committee. He explained nothing further could be done on the Neighbourhood Plan until WDC had issued the Local Plan. However, the questionnaire results had been made known to WDC when he and Cllr Cox had met with the District Planning Officer earlier in the week. WDC would then decide where new housing should take place and this would be followed by a consultation period. Rona said the findings were consistent with those of the Parish Plan and of the survey undertaken three years ago under the auspices of the Village Hall committee and the Residents’ Association. Thanks were given to Cllr Hickinbottom. A new parish clerk called Clare Turner had been appointed. She had volunteered to be the future Parish Council representative at BGRA committee meetings. Judi should add her to the distribution list. This item had been covered at the last meeting. Mary had reported that there were fewer adverts in the March edition but more had been promised for the June Bugle. The committee had received a request for funding of £200 to support the 2014 Made in Burton Green event. Having consulted the treasurer, the committee agreed to the request. The committee was assured that this year any profits from the Jubilee Jazz event would be paid to BGRA funds. Terry recommended that if the Jubilee committee events were to be annual, it would make sense to internally “ring fence” a fund for those purposes. This was agreed. Rona had reported to Solihull MBC two faulty signs at the junction of Hodgett’s Lane and Waste Lane and mud on the road which had been the cause of a motorist’s complaint. Janet said that the Solihull section of Hodgett’s Lane was to be closed for re-surfacing from April 1st to 4th 8.00 to 4:30. She was asked to make sure this was passed around the email loop. Parking just inside Hodgett’s Lane was becoming a problem as more people used the Greenway. Hilary would take this back to the Greenway Trust. The next committee meeting would take place on May 6th at 7.30p.m.at the Village Hall. 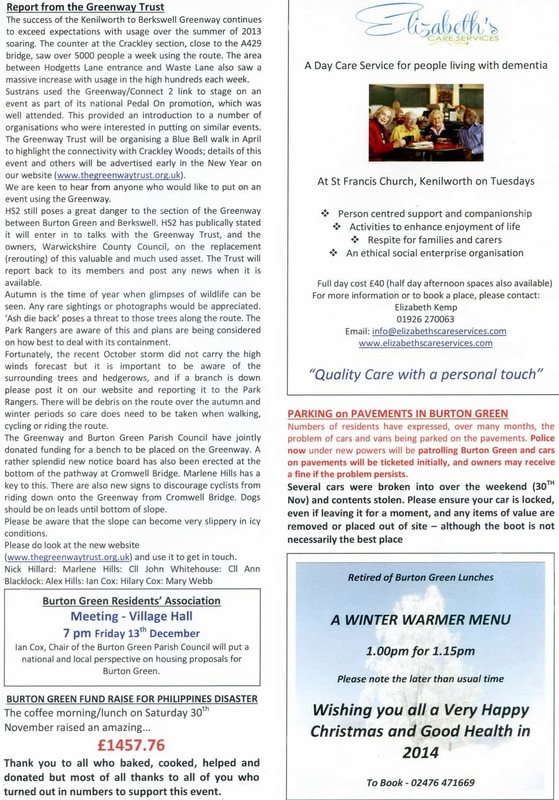 The March 2014 edition of the Bugle has been published. Jerry Marshall, a resident of Burton Green and campaigner against HS2, took part in a discussion on the Sunday Politics show on BBC2 on Sunday (2nd March). The context of the discussion was a proposal to create an engineering centre in the Birmingham area. Also taking part in the discussion were Tristram Hunt, Labour Transport spokesman, and Paul Uppal, a Conservative. Some useful insights into the future of transport, and the place of high-speed rail, if any, can be gained from America. The debate about high-speed rail in America has also become politicised. "With teleconferencing a reality and driverless cars on the way, bullet trains don’t seem so cutting-edge anymore... one reason we don’t have national high-speed rail, and probably never will, is that this is America." "When the California high speed rail was approved, I was quite disappointed. How could it be that the home of Silicon Valley and JPL – doing incredible things like indexing all the world’s knowledge and putting rovers on Mars – would build a bullet train that is both one of the most expensive per mile and one of the slowest in the world?....." Is Hyperloop a Realistic Alternative to High-Speed Rail? The successful Victorian railway system, that Britain exported to the world, was not the product of a mediocre state bureaucracy. It was developed and financed by private entrepreneurs, who were able to assess the costs, rewards and risks involved; people like Elon Musk. Where would these trains be designed and built? The BBC program seemed to suggest to viewers that the intention was to design high-speed trains in the UK, possibly at a site near Birmingham. Many people had previously thought that the intention was to purchase the technology, and possibly the trains, already built, from the Chinese. David Cameron has already made approaches, of some form, to the Chinese. It has also been suggested that, legally, any contract to build the trains would need to be put to an open tender, and that that would be likely to be won by the French, who would be in a position to make the most competitive bid.